Our thoughts, prayers and resources continue with Buddy and his family during this critical period. Matthew "Buddy" LaFontaine age 17, was diagnosed in April 2002 with Primary Hyperoxaluria Type I, a rare genetic condition of too much oxalate (salt form of acid) present in the urine causing kidney stones/ kidney failure which eventually required a transplant operation. On January 22, 2009, (his new birthday), Buddy underwent a triple transplant surgery replacing his Liver and both Kidneys @ Boston Children's Hospital. Buddy received ACCFCB's 2010 "COURAGE AWARD" at our 6th annual "Teed Off For Tot's" awards banquet held on June 25, 2010 @ Fairways Of Halfmoon. Buddy just returned from a month long stay in Boston Children's Hospital battling organ rejection. With our supporters help, we continue assisting Buddy and his family. We are pleased to report that Buddy is improving. Matthew "Buddy" LaFontaine age 16, was diagnosed in April 2002 with Primary Hyperoxaluria Type I. This is a rare genetic condition of too much oxalate (salt form of acid) present in the urine causing kidney stones/ kidney failure which eventually required a transplant operation. 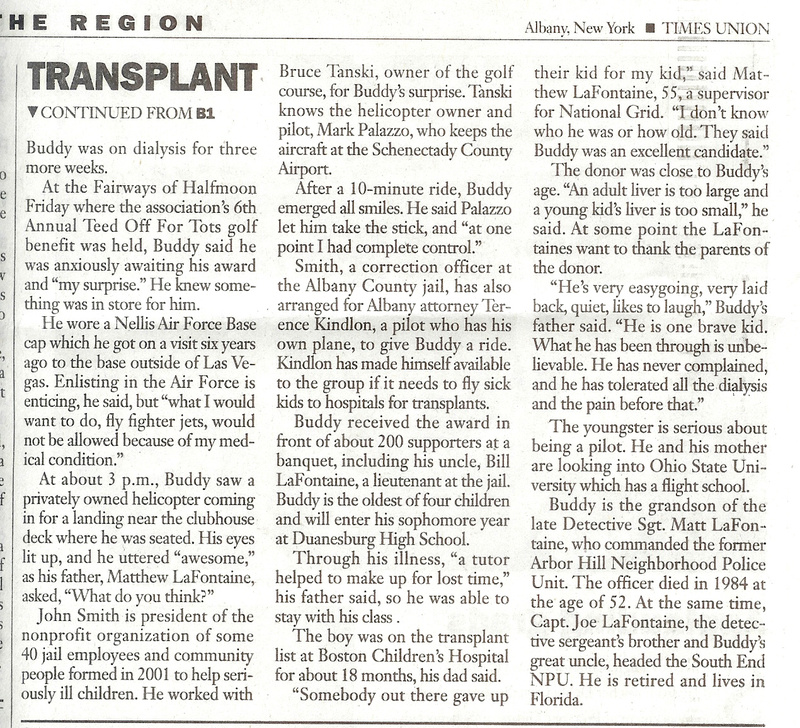 On January 22, 2009, Buddy courageously underwent a triple transplant surgery replacing his Liver and both Kidneys @ Boston Children's Hospital which would not have been possibly without the generosity of an unknown organ donor. He continues to celebrate his new birthday, January 22. Buddy received ACCFCB's 2010 "COURAGE AWARD" at our "Teed Off For Tot's" awards banquet June 25, 2010 @ Fairways Of Halfmoon. Matthew “Buddy” LaFontaine of Delanson, NY was diagnosed in April 2002 with Primary Hyperoxaluria Type I. This is a rare genetic condition of too much oxalate (salt form of acid) present in the urine causing multiple kidney stones/ kidney failure requiring a transplant operation. On January 22, 2009, Buddy underwent a triple transplant surgery replacing his liver and both kidneys @ Boston Children's Hospital. Buddy is doing very well since his transplant surgery. 1. HELICOPTER FLIGHT- 3 pm on Friday, June 25, 2010 @ the Fairways of Halfmoon golf course, Mechanicville, NY. Buddy will be in attendance to receive a “Courage Award” and will be given the thrill of his life when a helicopter lands on the course to take the aspiring pilot airborne- weather permitted. Very special thanks to Bruce Tanski, owner of Fairway’s of Halfmoon golf course and his wonderful staff. 2. COPILOT CESSNA- Buddy will be copilot to Attorney Terrence Kindlon, who without hesitation agreed to take Buddy up in his personal aircraft at the Selkirk airfield at a later date.